By Laure-Anne Visele: Interview date Dec 2013. Release date Apr 2014. 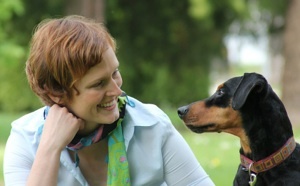 Bina is an animal trainer in Vienna. 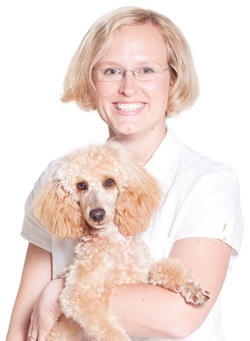 She helps countless families solve their pets’ problems through psychoanalysis. Just kidding. I couldn’t resist the Freud thing because Bina is based in Vienna. And I guess also because psychoanalysis is not that far off what Bina does: behaviour analysis. In both cases, the patient leaves with a new take on life’s stresses, and with better coping skills. Bina knows a thing or two about pet problem behaviour. She has gone through years of struggle with her own dog before stumbling across behaviour analysis. The dramatic results she got with her new skills attracted so much attention that she had to quit her day-job just to keep up with demand by other pet parents who needed help. 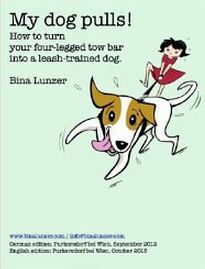 Read on for a peak behind the curtains in Bina’s life as an author, mother, animal trainer and dog entrepreneur. LV: How did you get started with dogs? BL : My first experience was a bite… And the next one too. The third bite even sent me to the emergency room. The first incident happened when I was three. I was walking with my parents in the countryside and this farm dog came out of the yard and just bit me. I’ve no idea why. BL : Looking back, I know these dogs weren’t properly looked after. The German Shepherd was trained thirty years ago, for schutzhund [protection work], and with methods that were thirty years out-of-date even then… Even when I was five I suspected the humans had been the problem there. I still think so. My parents have been so fearful of dogs since the bites that they don’t understand how I can keep two ‘carnivores’, as they call them, in the same house as my daughter. But I don’t know where my deep love of animals comes from. Life without them is not worth living for me. LV: So what’s the Lunzer family setup? BL : I live with my husband and daughter, and our two dogs (Emil and Nello), and three rats (Kuba, Kristin and Kigali). LV: And the rats are trained I presume? BL : Of course! They do tricks like scent-discrimination, card tricks. BL: Yes, they can pick the aces out of a 32-card pack and flip them over. They will do these things again and again and again, and more and more enthusiastically. Rats just love to work. It was a cool shaping experience for me. And of course I’ve taught my dog, Emil, to find my keys. LV: I’ve taught my dog that too! And also to find bank notes. Handy hey? So, does your daughter also love dogs? … So we bought a rat! The idea was: to qualify for a dog, she had to prove she could care for a rat for two years. And she did brilliant. So we got a mini poodle (eleven months at the time of writing). LV: Haaaaa! You still need to go through the teenage phase with the poodle and soon with your daughter. BL : [laughs] She’s a cool kid! She really gets positive reinforcement. She does it to us. After I help her with homework, she’ll say: “Thanks mom. That was a great help!” instead of complaining. LV: So how did you become a dog professional? 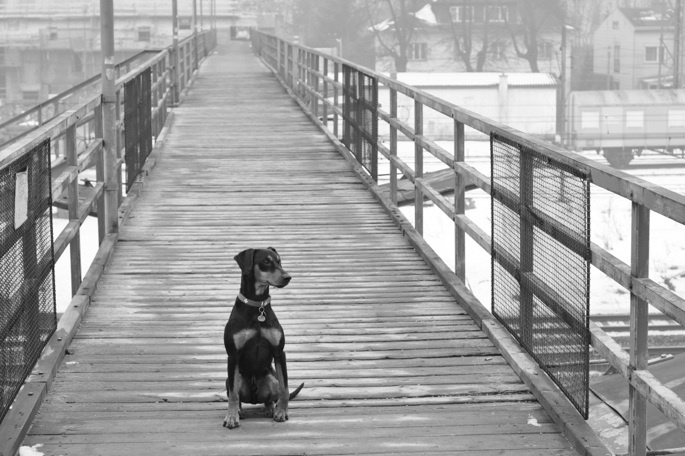 BL : Emil, my Pinscher, had every behaviour problem in the book. My previous dog had been so easy, that it took Emil for me to relate to people with dogs with behaviour problems. It was exhausting. I had bought him for search and rescue, but he just didn’t respond well to training. If pressured, he would run off and hide under the car. LV: Did you get him as a pup? BL : Yes. But he was under-socialized. His breeder had lost two litters from disease so he took hygiene very seriously. I can put myself in his place: he didn’t want to lose a litter ever again. But according to the American Veterinary Association, more dogs die from behaviour problems related to insufficient socialisation than from infection. It is tragic if your pup is the exception to the rule, but, statistically, it is the better choice to attend early puppy class. LV: So Emil had not been socialized sufficiently? BL : That’s right, and he had other problems too, like resource guarding. I even travelled to get help from famous trainers. But most of them recommended I just give him up. But I don’t give away family members. So the advice the trainers gave me was to hit my dog harder. And you could never hit hard enough for them. Sometimes, I would cry all the way home, thinking: “Having an obedient dog is just not worth this. I am disgusted with what I am told to do.” So, I quit traditional training. I hated it. LV: How long ago was that? BL : About seven years ago. LV: Wow, so the positive revolution is quite recent in Austria, then? Are most schools now positive? BL : Some of these schools were already positioning themselves as positive. But they were only positive as long as the dog complied. As soon as they added distractions and the dog got it wrong, they asked you to hit your dog. LV: So how did you start learning about dog behaviour? Did you follow a course? BL : I did the Certificate in Canine Behavior Science and Technology with James O’Heare’s Companion Animal Science Institute. I only did it to help with Emil. I had been waiting so long for this: the course finally confirmed to me that force was completely unnecessary to raise a reliable dog. LV: Wow, James O’Heare! He is a giant in Behaviour Analysis [a behaviour modification approach based on the manipulation of what precedes and follows unwanted behaviour]. BL : Oh yes! I would labour over a tough point for days, in vain. Then I would ask him and he could answer in half a minute. LV: The chapter he wrote about the different trends of behaviourism is a thing of beauty. BL : He is a genius. Then I also did Tag Teach 2 [a teaching method optimizing learning efficiency through teaching in bite-size, visual chunks]. And then I did the “Clicker Trainer Switzerland/Germany/Austria.” It is similar to Kay Lawrence’s KAP. LV: So how did you turn pro? BL : After I did James O’Heare’s course, people started noticing that my dog was completely focused on me, he’d stopped scavenging, came when I called, walked on a loose leash, etc. And they would ask me to help with their own dog. So I helped them out for fun. But these people then spread the word, and before I knew it, I had to set up a business. It started with six clients, then nine, and it just grew from there, as each client told three others how fast it worked. I had to reduce my day-job hours more and more. In the end, I only had ten hours in the office, so I quit. Going professional just happened to me. It wasn’t a planned decision. LV: What were you doing before you became a trainer? BL : I was a process optimizer. It’s obvious when you watch my tutorials. People often remark about how different my two careers have been, but actually, I still optimize processes. Only now I optimize the processes between four- and two-legged animals, rather than computers. I still look for that precise tiny thing that will make the difference, so I don’t end up changing things that already work today. LV: Tell me about your work with dogs and kids. “Dogs & Storks”: for dog-owning families expecting a baby. “Dog & Baby Connection”: for parents of babies and toddlers who also own a dog. I coordinate these activities for the German speaking countries. Jennifer from Family Paws does the licensing. That project is my professional baby. I am really proud of our network of German presenters. We work with the highest quality trainers you can get. Getting great trainers is also a question of safety in this case, as children are involved. I love that I can reach completely different clients through this work than I do through the training school. It gets me people with seven-year old dogs who’d never done much training and who barked all night if he’s not allowed to sleep on the bed with them. LV: You’re saving a lot of dogs from the shelter that way, no? I know so many people who have abandoned their dog when they got a baby. BL : We call it the ‘rehoming impulse’. Families with kids under three years old sometimes fantasize about what it would be like to not have a dog. Even dog trainers have this phase, apparently. So it’s nothing to do with how much you know about dogs, and it’s nothing to do with how severe the behaviour problems are. It is just that the small things like pushing the stroller with a dog who pulls on the leash can be exhausting. And we also teach parents about dogs’ body language in these workshops. 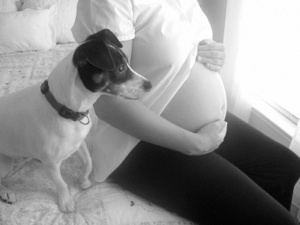 It is an important safety measure in a household with a dog and a baby. LV: Is there such a thing as a typical week for you? What’s that like? BL : I give about six behaviour consults per day. It’s mainly for dogs, but I also do other pets. A couple of days per week, I go to my training grounds to give group classes. I give puppy classes, basic obedience, sports trials, object search, and that sort of thing… My classes are very solution-oriented, with themes on the recall, on relaxing, etc. I started these classes for my own sanity. So I could see normal pups and not just animals with severe behaviour problems. LV: Don’t you catch yourself permanently screening for behaviour problems, even in normal dogs? BL: No. I try not to raise my dogs like a teacher’s child. The mini poodle, for example, barks at other dogs. It looks arousal-based and we work on it constantly, but I won’t instantly assume it’s dog-dog aggression. I try not to approach problems until I have them. This is something my daughter taught me. LV: So what do you do the rest of the time? BL : I spend one day a week on office work: bookkeeping, writing articles, preparing presentations, etc. and, at week-ends, I travel to the German countries (Switzerland, Austria, Germany) to give seminars. My most popular one is about Loose Leash Walking. I also consult with animal trainers and other organizations. Right now, for example, I am talking with this orphanage that allows its employees to bring dogs. There is a lot of teaching potential in animal-kid interactions there. At that same institution, there is also a social worker who graduated from a university course on animal-assisted therapy. When we work together, I focus on the dog’s behaviour: body language, setting up safe situations, etc. And I also teach basic manners so the dogs can be safe around kids. LV: Is dog training a protected profession in Austria? What kinds of trainers are offering their services? BL : In the German-speaking countries, breed clubs charge a one-off 100 euro (or so) fee, then a yearly 30-50 euros. That entitles you to free dog training classes. The professionals then have to compete with free trainers. The difference between the free classes is not always obvious. But you do see classes with twenty loose puppies ranging from weeks-old toy dogs to adolescent giants. In contrast, we run with four pups per class. I value the free puppy trainers. Lots of dogs would get no education without them. But you can’t expect them to have the same educational background as a behaviour consultant. So it’s tough starting a business where other people offer similar services for free. Having said that, professionalization is making strides in Austria. LV: That sounds like a tough market. So what do you call yourself? Animal trainer? Behaviourist? BL : “Animal trainer and behaviour consultant”. LV: You’re having a trail-blazer of a career. Can you run me through your big milestones? BL: I wrote two books. One is about helping nervous dogs lead a calmer life; the other one about pulling on the leash [My dog pulls]. And then of course I coordinate Dogs & Storks and the Dog & Baby Connection for the German-speaking countries. I also did a YouTube video about loose leash walking that got a bizarre amount of hits (almost 200,000) [To see the video In German or in English]. That means something like one out of ten German-speaking dog owner has seen the video! LV: That’s an insane number! LV: What are your proudest moments? BL : Every time I can resolve a dog’s issues with science-based training. Things like resource guarding, leash pulling, lack of cooperation, etc. I am happiest when I can improve the dog-human relationship. That is really motivating. LV: I know the feeling! It’s really nice. BL : That’s why we do this job. LV: Good results, despite the fact that I get them nearly every time, always take me by surprise. I enter into it thinking: “If they listen, they listen. If they don’t, I am not going to get too invested. That’s a recipe for a burn-out.” So I am always surprised when they write back to say how much their lives improved. They follow through! It’s so nice to hear. BL : That’s the cool thing about our job, when lots of clients appreciate our help. I bumped into this client from years ago in the supermarket, and they hugged me! They were so thankful, you’d think I removed a brain tumour. It’s the modern way of living with dogs. We see them as family members. A dog’s behaviour problem is not just a dog problem any more. It severely affects the family’s harmony. And a dog trainer can solve that. I also enjoy seeing a client realize that brutality and fear are not necessary for training a reliable dog. I love to watch them put this to practice. LV: A lot of clients are relieved when I tell them they don’t have to keep intimidating the dog. Every one else up till that point had told them it was the only way. BL : Yes, like when I went home from training crying. Who would enjoy going through this? Hitting my dog – who is a family member – and feeling so bad for it. LV: What is your favourite aspect of what you do? BL : I love everything about my job: presentations, group classes, private consultations, writing. I love that I have all these options. I also love working with animals and with people. LV: There must be a least favorite aspect, no? BL: I don’t like bookkeeping. But apart from that, no. I even like more difficult customers. They challenge me. They keep my people skills sharp. LV: If you had a magic wand that would brainwash everybody into believing what you say for the next few seconds, what would you say? BL: Trust is vital for reliability, so a reliable dog is one that was trained without fear. If you took a dog home as a companion, treat him like a family member and he’ll become one. If you hit him, he’ll never be a family member. YouTube channel: Tips on how to teach your dog to shed bad habits the nice way. Mainly in German. Dog & Baby Connection and Dogs & Storks: Presentations for (grand)parents-to-be and (grand)parents of babies and toddlers on safe cohabitation with dogs. In German. Dog training school: Happy Training. Dog training school in the suburbs of Vienna with obedience themes cycles (e.g. pulling on the leash), puppy class, and dog sports. Science-based and force-free methods. (free) Book reviews: Send me a hard copy of your book for a review. My book reviews are read by many pet professionals and parents. Dog training school: OhMyDog! is The Hague’s fun-packed, force-free and science-based dog training school. Small groups, great results, relaxed atmosphere and beautiful field. Lessons in English and Dutch. Private training and behaviour therapy: If you are in The Hague or region, I can help you solve your dog’s behaviour problems using no force or intimidation. In Dutch, English and French. Writing services: If you are a dog professional anywhere in the world, I can re-write your landing page for better readability and search results. I also write science popularization articles about dog behaviour in English and French. I also translate technical material from French and Dutch to English. Pet photography: Professional pet photography for your own pet, magazine, book or dog business. 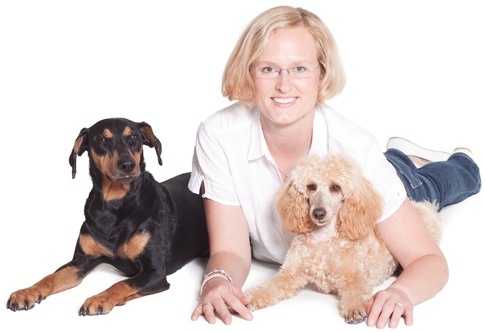 This entry was posted in Dog pros: a day in the life and tagged austria, behaviourist, Bina Lunzer, canine behaviourist, dog and baby, dog behaviour problem, dog behaviourist, dog trainer, germany, interview, problem behaviour, pulling on the leash, rat training, switzerland. Bookmark the permalink. Post a comment or leave a trackback: Trackback URL.